There finally comes the time when a committed environmentalist takes the big step and turns to solar power as the home energy source. This is not a move to be taken lightly but it is one that can generate benefits as well as comfortable heat. Solar panels can be a do-it-yourself job and there are kits available for the amateur to work with. Yet, as with any sizable home renovation, it is essential to do a little bit of preliminary investigation and determine what can and cannot be done in the living space. Installing solar panels to heat one room is easy enough but doing panels for the entire house can be quite a challenge for a novice. With large-scale projects it is probably a good idea to bring in professional contractors. These professionals have worked with large-scale projects before and can make recommendations on how to best put the paneling in. They may also give ideas on how to best operate solar panels once they are in place and working. The architecture of the home is a primary point of consideration, for the angles of the windows and the existing exposure of the various rooms determine the type of solar panel necessary. Environmentally conscious people will install solar panels because it is the right thing to do. Most others will contemplate the energy savings that have been promoted. The cost of putting in solar panels for an entire house is expensive and the costs are all upfront. A homeowner must go into this realizing that the break-even point where the cost savings equal the original investment could be ten years or more. That can be a very sobering thought for anyone. Fortunately, there are tax incentives to offset the expenses. The Federal government continues to support the installation of solar energy alternatives and the states offer a varying amount of assistance. This can tip the scales in favor of solar panels. For example, a home in Columbus, Ohio, using an average of 1500 kWh/month and paying $175 per month in energy costs, can have up to 62% of the cost of installation paid for by various incentives. That same home would enjoy a monthly savings of approximately $95.00. That last figure is a strong reason for putting in solar paneling. The final part of the decision making is the owner’s commitment to the property. Anyone who is willing to live in the house for an extended period will enjoy higher ROI (return on investment) as the years go on. Another point in favor of solar powering is the environmental benefits. The same home in our example, without solar energy, releases over 25,000 pounds of carbon dioxide annually. 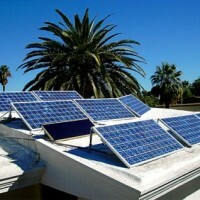 Adopting solar power will dramatically decrease that home’s carbon foot print. The upfront cost of installing solar energy machinery may be a little daunting, but the final benefits definitely justify the switch to solar power.